January 21, 2019 We have some terrible news to share about Ace Combat 7’s jpeg dog. In what Chris has already named “the worst story of 2019,” we have some bad news to share about Ace Combat 7’s adorable runway dog. According to the game’s brand director, Kazutoki Kono, the loyal canine is an in-game tribute to a developer’s dear-departed dog. 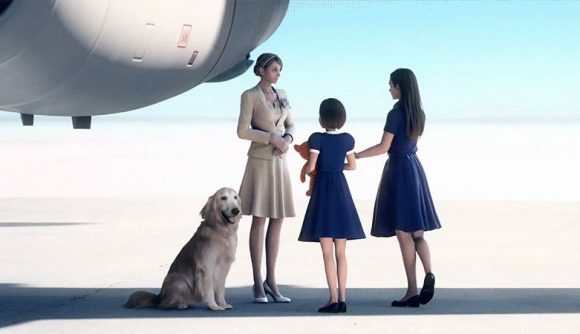 Ace Combat 7: Skies Unknown released last week, and it didn’t take players long to notice that a Golden Retriever was beside the painstakingly-rendered planes and characters in a couple of the game’s cutscenes. Weirdly, however, the dog was entirely still, a 2D image in a world of 3D models, his only discernible movements the result of the heat-haze coming off the tarmac around him. After jpeg dog was discovered, Ace Combat 7 developer Bandai Namco got in on the fun, tagging the popular gag account @dog_rates in their response. Since then, the memes have been coming fast and furious. I’ve opted to leave this article’s memes intact as a tribute to jpeg dog, who brought so much love in his short time with us. Some people might previously have said that simply adding in a photo to a major release was cutting corners, but now those people would be monsters. Goodnight, jpeg dog. May flights of angels sing thee to thy rest.